Nisin is a natural additive for conservation of food, pharmaceutical, and dental products and can be used as a therapeutic agent. Nisin inhibits the outgrowth of spores, the growth of a variety of Gram-positive and Gram-negative bacteria. This study was performed to optimize large-scale nisin production in skimmed milk and subproducts aiming at low-costs process and stimulating its utilization. Lactococcus lactis American Type Culture Collection (ATCC) 11454 was developed in a rotary shaker (30°C/36 h/100 rpm) in diluted skimmed milk and nisin activity, growth parameters, and media components were also studied. 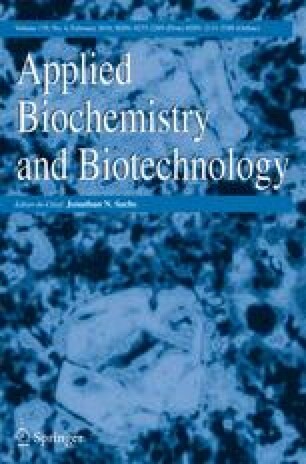 Nisin activity in growth media was expressed in arbitrary units (AU/mL) and converted to standard nisin concentration (Nisaplin®, 25 mg of pure nisin is 1.0×106 AU/mL). Nisin activity in skimmed milk 2.27 gtotal solids was up to threefold higher than transfers in skimmed milk 4.54 gtotal solids and was up to 85-fold higher than transfers in skimmed milk 1.14 gtotal solids. L. lactis was assayed in a New Brunswick fermentor with 1.5 L of diluted skimmed milk (2.27 gtotal solids) and airflow of 1.5 mL/min (30°C/36/200 rpm), without pH control. In this condition nisin activity was observed after 4 h (45.07 AU/mL) and in the end of 36 h process (3312.07 AU/mL). This work shows the utilization of a low-cost growth medium (diluted skimmed milk) to nisin production with wide applications. Furthermore, milk subproducts (milk whey) can be exploited in nisin production, because in Brazil 50% of milk whey is disposed with no treatment in rivers and because of high organic matter concentrations it is considered an important pollutant. In this particular case an optimized production of an antimicrobial would be lined up with industrial disposal recycling.